The top-flight sensor enabled the E-PM2 to turn in excellent performance on our DxOMark Sensor Scores, delivering the sixth highest Overall Score of all hybrid cameras we’ve tested, at 72. In fact, it scored within the top 10 on all Use Case scores as well, getting a particular boost from its excellent Sports score of 932 ISO, which is higher than many APS-C-based hybrids such as the Sony Alpha NEX-5 and all of the Samsung models. This indicates that the E-PM2 is a good choice for low-light or sports photography, which is particularly admirable given its very compact size. The updated sensor enabled the E-PM2 to improve every aspect of image quality significantly over its predecessor, the E-PM1. The Overall Score is a good 20 points higher, and we can expect better performance in good lighting conditions—for instance, its Portrait Score of 22.7bits (vs. the E-PM1’s 21 bits) indicates that it can perform 1.3 stops better in color depth. Because the new sensor provides less noise for low ISO settings, color will be more precisely described. The increase in the Landscape score is even more pronounced, with the E-PM2 scoring 12.2 Evs (vs. the E-PM1’s 10.3 Evs). This indicates that the E-PM2 can perform 2 stops better in dynamic range, which means a wider dynamic range that can help you achieve better landscape shots. Given that Dynamic Range measures the ratio between the highest and lowest gray luminance a sensor can capture, this score makes it clear that the improvement for dark noise is spectacular, especially since it was one of the main weaknesses of the E-PM1. You can also expect significantly better low-light ISO performance, from the E-PM2—1 full stop better, in fact—given its score of 932 ISO (vs. 499 ISO in the E-PM1). Taking a look at the SNR 18 % comparison, in print mode for the same sensitivity, the E-PM2 provides a SNR close to 3db better than the E-PM1. This indicates that the new sensor is 1 stop more sensitive than the one in the E-PM1. It comes as no surprise that the Olympus PEN E-PM2 scores virtually identically to Olympus’ top-of-the-line OM-D E-M5 since they share the same sensor (as does the midrange Olympus PEN E-PL5). The E-PM2 actually comes in at one point higher than the E-M5 on the Overall Score, though that difference is negligible. The two cameras essentially have the same performance in color depth and dynamic range, and the E-PM2 scores less than 1/4 stop better in low-light ISO. The tests confirm that the two cameras have the same sensor, but the E-M5 commands the higher position in the lineup (and a much higher price, naturally, at $1,099), because of its higher-end feature set and much better build. Not only does the E-M5 sport a classically retro look reminiscent of the Olympus OM line of compact full-frame professional 35mm SLRs from the 1970s, but it also has a weather-sealed, dustproof and splash proof body designed for durability. Other features of the E-M5 that outstrip the E-PM2 include a built-in electronic viewfinder, a higher-resolution (610,000 dot) articulating LCD, 9 fps continuous shooting, total manual control via two full-size control dials and dedicated function buttons, and more. The EPM2’s most obvious competitors are the Panasonic Lumix DMC-GF5 and the Nikon 1 J2, both of which it beats handily in terms of overall DxOMark Sensor Score. 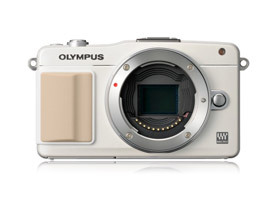 Last year’s Olympus hybrid lineup, which sported older sensor technology, played second fiddle to the Panasonic lineup in many ways, but with this year’s models all based on the same new 16-megapixel sensor, Olympus now takes the lead for Micro Four Thirds cameras, with even the $599 entry-level E-PM2 outpacing all the Panasonic hybrids we’ve tested so far (including the Panasonic Lumix DMC-G5, -GF5, and -GX1). When compared to its most direct competitor, Panasonic’s entry-level DMC-GF5 ($599.99), for instance, the E-PM2 scores a whopping 22 points more with a 72 (vs. the GF5’s Overall Score of 50). In terms of individual Use Case scores, the E-PM2 scores more than 1 stop better than the GF5 in color depth, a whole 2 stops better in dynamic range, and 2/3 of a stop better in low light. The E-PM2 leads the GF5 in terms of specs as well, starting with the higher-resolution sensor (the GF5’s is a 12 megapixel model), and including a higher maximum ISO of 25,600 (vs. the GF5’s 12,800 max), a faster continuous shooting rate of 8 fps vs. 4 fps, and more autofocus points (35 vs. 23). Nikon’s entry-level hybrid camera, the Nikon 1 J2 (another direct competitor at $549.95), inherits its sensor from its predecessor, the first-generation Nikon 1 J1. The CX-sized sensor (which at 13×8.8mm is smaller than both Micro Four Thirds and APS-C sensors) performed competitively with the larger sensors in the previous generation of Olympus hybrids, but its no match for the newer sensor in the E-PM2, which pulls ahead and beats the J2’s Overall DxOMark score by 18 points. Not only is the E-PM2 1.5 stops better in color depth and 1.5 stops better in dynamic range, but it is also 1.3 stops better than the J2 in low-light ISO—no surprise given the significantly larger sensor area in the E-PM2. For about $50 more, the E-PM2 also serves up significantly better specs. In addition to its higher-resolution and larger sensor (compared with the J2’s 10 megapixel sensor), the E-PM2 outstrips the J2’s maximum ISO of 6,400 with its 25,600 max and also shoots 3 fps faster in continuous shooting mode. The use of Olympus’ top-of-the-line Micro Four Thirds CMOS sensor brings its entry-level PEN E-PM2 to a new level of image quality, allowing it to handily beat out all the competitors in its low-end price range. Add to that an ever-growing list of features that bring it closer than ever to matching Olympus’ step-up midrange model, the PEN E-PL5, and that means this new super compact hybrid shooter is a great choice for people looking to shoot sports or landscapes while minimizing their load.